In the early 1990s, financial liberalization started in India, and it was thought that such reforms would increase economic growth. This argument formed part of the finance led industrialization hypothesis and although higher growth resulted, higher industrialization did not immediately. 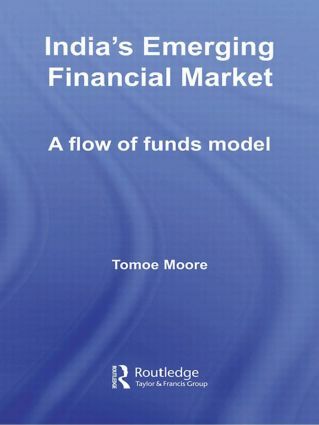 This book is the first study to comprehensively apply the flow of funds model for India. Using detailed data of the Indian economy, the whole financial sector is presented with associated policy simulation for India. The demand function is theoretically grounded in the Almost Ideal Demand System and cointegration techniques are adapted into the econometric methodology. The policy simulation experiments are conducted with a view to analyzing the delivery of loanable funds to sectors which are the most in need of poverty-reducing economic growth. The system-wide simulation as a result of interactions with disaggregated economic sectors will allow the analysis of a wide spectrum of policy effects on issues such as the determinant of interest rates, financial capital formulation, and the role of financial institutions, government debt and allocation of credit. India's Emerging Financial Market provides a thorough and rigorous analysis of policy responses in India and will be of interest to academics working on development economics in general and South Asia in particular.